Firstly, thank you all for your thoughts and feedback for my book title. How wonderful having twenty other women’s brains buzzing with ideas – I love crowd-sourcing – you came up with so many angles that I had not considered. I’ve been listening to all the woo-woo warnings from y’all! Rainbows are too hippy. And off putting. And we don’t like the word mamas it seems either. I hear ya. Thank you. Solid, sensible. Does what it says on the tin. Non-alienating. Even though it didn’t sing to my soul. But it’s more important that it talks to you, dear reader, than me. After all, y’all will be buying it in your droves – right? It will be thanks to the massive popularity of this book that I will be able to afford a housekeeper for another couple of hours a week and no longer live in a hovel, but instead focus on what I am good on – creating magical women’s work! It’s this book that’s gonna get me onto Oprah’s sofa… oh, except there is no Oprah show any more- another dream bites the dust! But, then a couple of women who really understand me – one from spending far too long with me – Leigh, my dear real life friend, who listens and listens to each of my new dramas and complaints and eats cake companionably… And, Becky – who I’ve never met in real life, but we moon dance in virtual connection, thanks to the Goddess Circle, and she just gets me, really, truly does. They both gave me the “to thine own self be true” spiel – but in a totally right on way. Don’t you just LOVE it when real friends do this? They were both very clear- Lucy, rainbows are key to your work. And you know what? They are! 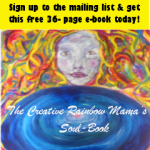 In my paintings, in my (borrowed) ideas about rainbow streams of abundance and the rainbow mama archetype, and even the rainbow man that I drew when I was nine, which I knew was a significant image for me and one that I was deeply proud of, even though the teacher was a bit non-plussed by. Rainbows speak of living with all the colours, of creating, of not living a grey life, of varieties of possibility, of hope, of beauty…and of a new female archetype and way of earning. The book centres on these ideas. 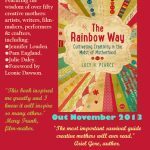 But I took on board that women did not feel an affinity or connection with the idea of the creative rainbow mama. So I cut up all the possible words and played with them, spreading them out on the floor (thanks to my friend Tracy for dropping this idea into my consciousness a couple of weeks ago). And my favourite just appeared. There on the floor. About 24 hours before Becky made her (almost identical) suggestion! And we’re loving your subtitle to Becky – though taking on board the need to make the title a non-statement. 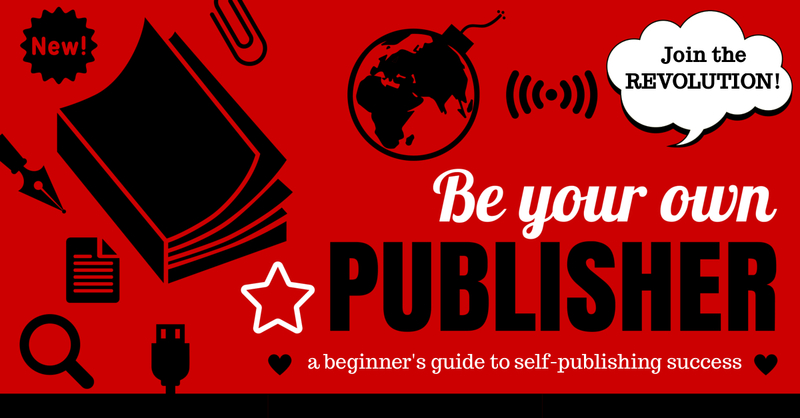 And not sound like a parenting book – all great tips, thanking you – and so, we have a title. Refined with my dearest Mr DA.